The Little Big Club is spread over two levels of the Puteri Harbour Theme Park on the 2nd and 3rd floor of the building. 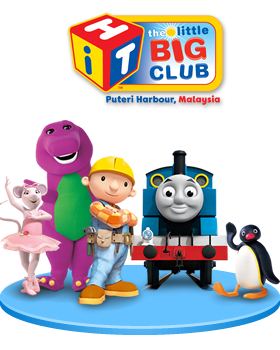 It is here at the Little Big Club where your children can meet their favourite childhood characters, Bob the Builder®, Barney®, Angelina Ballerina®, Pingu® and Thomas & Friends®. It is supposedly the first time in the world that these five popular childhood characters are placed in a single themed attraction, further adding originality and exclusivity to The Little Big Club. Though Anne, my 10 year old daughter was already a little too big for all these characters, she did have a fun time reminiscing on all those early childhood years here when she was a huge fan of Barney , Pingu and Angelina Ballerina..
Children get lots of fun with the Bob the Builder® Play Structure as well as Bob’s Can-Do-Crew, where they are able to help build houses in Bobsville through activities that include brick laying, door and window framing, kitchen and bath assembly, just like Bob does. The second level of the Little Big Club (3rd floor of the Puteri Harbour Theme Park) features the famous Thomas & Friends® characters that offer multiple rides such as Bumping Buffers Steamies & Diesels bumper cars, which are themed on Thomas, Percy, Mavis as well as the Troublesome Trucks characters, each with different facial expressions. We got to check out and also enjoy some rides on Bertie the Bus, Harold’s Helitours, Colin Crane Drop rides and visit Sir Topham Hatt’s Play Station together with Thomas & Friends® Imagination Station. Getting there: From the Kuala Lumpur Plus highway Sanrio Hello Kitty Town can be reached by taking exit 253 to Senai Airport and then exit 311 to Kota Iskandar: from this road it is a short drive to Puteri Harbour where the park is located.